The volume of data streaming into the data center has been growing exponentially for decades. Bandwidth requirements are expected to continue growing 25 percent to 35 percent per year. At the same time, lower latency requirements continue to escalate. As a result, the design of services and applications—and how they are delivered—is rapidly evolving. Instead of a single dedicated server, information requests coming into the data center are now fulfilled by multiple servers cooperating in parallelThe traditional three-tier network is quickly being replaced by spine-and-leaf networks. 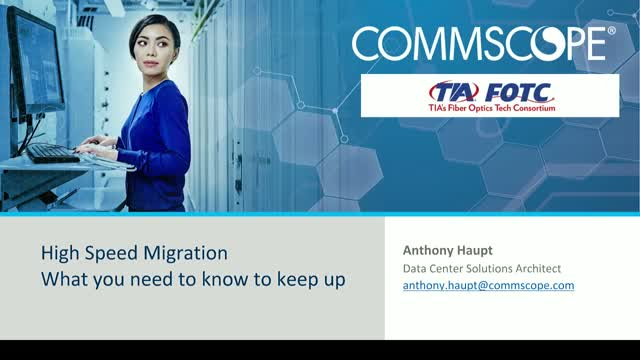 As a result, the physical infrastructure must be able to support higher link speeds and greater fiber density while enabling quick and easy migration to new more demanding applications. Singlemode, multimode or wideband multimode fiber? Attendees with earn one BICSI Continuing Education Credit for attending.